In 1969, the astrophysicists Rashid Sunyaev and Yakov Zel'dovich realized that the then recently discovered cosmic microwave background radiation (CMBR) would be distorted by hot cosmic gas. Hot electrons in the intergalactic medium preferentially scatter the light in one direction, causing a change in the brightness of the CMBR towards clusters of galaxies where electrons should be abundant. They showed that the effect would reveal the large-scale structure of the universe, the nature of the CMBR, cosmological parameters like the Hubble constant, and physical conditions in galaxy clusters. The effect, now known as the Sunyaev-Zel'dovich effect (SZE), was first spotted in 1978 after much searching. 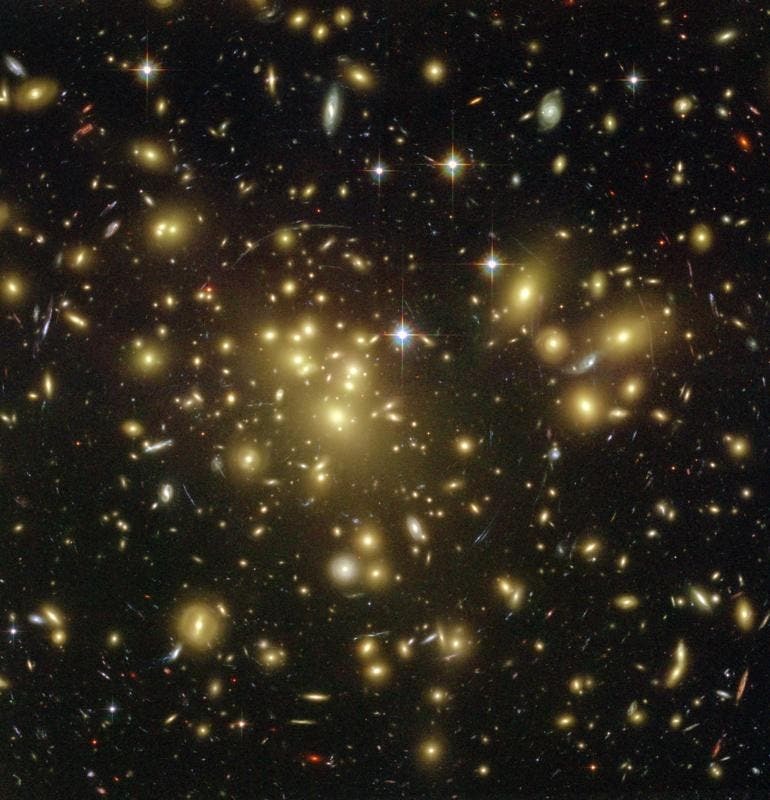 Both space- and ground-based instruments, including the Planck satellite, the South Pole Telescope (SPT), and others have released new catalogs of galaxy clusters selected using the SZE. CfA astronomers were part of a large team that used the SPT to examine the SZE signatures of forty-six X-ray selected groups and clusters of galaxies. The X-ray observations are some of the most sensitive ever used to search for clusters; the most distant of the galaxy clusters detected to date from a cosmic epoch six billion years after the big bang. The team reports generally very good agreement between the cosmological parameters they measure and those reported by other means, in particular the latest results from the Planck satellite study of the CMBR. However the agreement is not perfect: the team reports an unexpectedly weak SZE signal for less massive galaxy clusters. Although they did identify and measure several potential sources of contamination, the discrepancy is not easily explained away. They suggest one possibility: dust within the clusters is reducing the SZE signal. For now, the reason remains unknown; this mystery will be addressed in subsequent, deeper, more sensitive SZE observations planned for the SPT. The image at the top of the page shows Abell 1689, one of the most massive galaxy clusters known. The hot gas in this and other galaxy clusters distort the shape of the cosmic microwave background radiation (the "SZ Effect"), and sensitive new results on these distortions from the South Pole Telescope confirm and refine previous conclusions while identifying some puzzling discrepancies. Einstein's Telescope –"A Big Clue to the Amount of Dark Matter in the Universe"
The Higgs Particle –"It Can Disintegrate Into Dark Matter"